Description: New France. First edition. Five Great Lakes. Original colour. Description: De L'Isle's seminal map of Canada and the paradigm for the mapping of the country in the early 18th century. Original colour. Description: Beautiful map of Eastern Canada with original colour. Covens & Mortier's version of the De L'Isle map. Description: Nouvelle France. Newfoundland to Ontario. Cartouche. Description: Northeast Canada. Shows the boundary lines as depicted after the end of the French Indian War. Original colour. Description: Hudson's Bay. Small sea chart. Original colour. 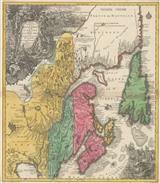 Description: Early map of the whole of Canada, unusual in that it shows both the eastern and western coastlines. It also shows important discoveries made by A. McKenzie and S. Hearne. Original hand colour. Description: Copper engraved map of Canada in original colour showing Hearne and MacKenzie's discoveries. Description: Early fanciful map of Canada showing both East and West shores and various legendary river courses. Coloured. Description: Canada, highlighting British possessions. Coloured. Description: Finely-engraved map of Canada, New England, and the Pacific Northwest. Reduced from Arrowsmith's larger map of North America, the only map to accompany Lewis & Clark on their expedition to the Pacific. Description: Handsome map in original colour showing the whole country during an important period. Description: Miniature map marking Mackenzie’s 1789 and 1793 journeys to the Arctic and Pacific coasts. Mackenzie was one of the most celebrated explorers in Canadian history and the first European to traverse the continent north of Mexico. He later became the second Prime Minister of Canada. Coloured. Description: British Possessions in North America. Large, detailed map in original colour, surrounded by text describing the History and Geography.